As an Adobe Lightroom user, you have access to all kinds of great editing tools. But there will be times where you really want or need the tools provided by DxO PhotoLab, such as unique RAW converting, advanced noise removal with PRIME Noise Reduction, or the incredible DxO ClearView Plus tool. How you get your RAW file into DxO PhotoLab depends on which version of Adobe Lightroom you’re using. If you’re an Adobe Lightroom Classic user, then the workflow to get from Adobe Lightroom to DxO PhotoLab is well established — but let’s have a quick recap. Since DxO PhotoLab excels as a RAW converter, you want to send your RAW file to it. 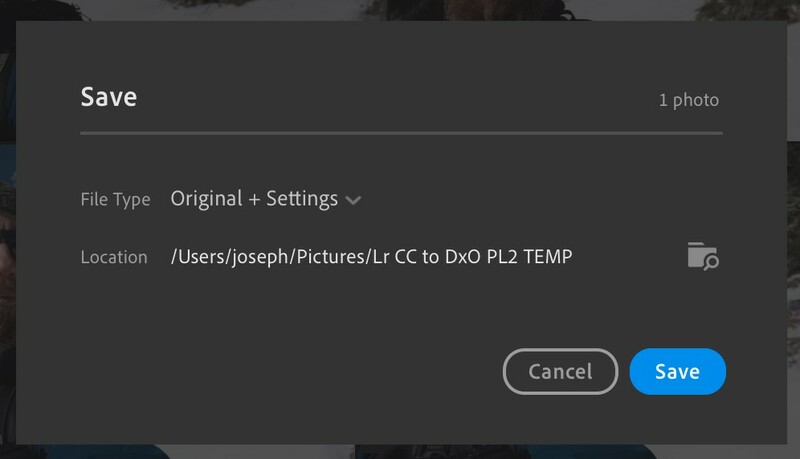 Select any photo in Adobe Lightroom, and from the File menu, choose File > Plug-in Extras > Transfer to DxO PhotoLab 2 (this is in stark contrast to the standard plug-in option, Photo > Edit In, which would render a TIF file and send that to an app or plug-in). The RAW file will be sent to DxO PhotoLab, where you can do whatever edits you want. When finished, click the export button in the bottom right corner and select Export to Adobe Lightroom. That will let you choose the format of the exported file, which will automatically be rendered and saved in the same folder where the original RAW file is on your computer. Back in Adobe Lightroom, this will automatically show up as a stacked image next to the original in the Folders view. Nice and easy! If you’re using Collections, it’s just one more step, as the newly created file will not show up as a stacked photo in the collection where you started from. However DxO PhotoLab actually creates a new timestamped collection with every export, making it very easy to find. If you want to add it to the collection where you started from, just drag the photo from the DxO PhotoLab collection to wherever you want it. 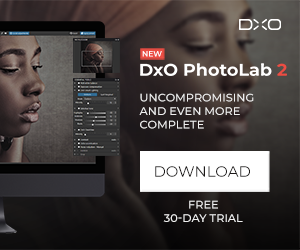 DxO PhotoLab puts your rendered image into a unique timestamped collection, making it easy to find back in Lightroom. If you’re a CC user, things get a little more complicated. Unfortunately Adobe hasn’t yet opened up a plug-in architecture for Adobe Lightroom CC, which means there are no automated ways to move the RAW photo from Adobe Lightroom CC into DxO PhotoLab. There isn’t even a plug-in menu to use any third party plugins at all! But that doesn’t mean you’re locked out of all these tools — it just means you have to jump through a few more hoops. 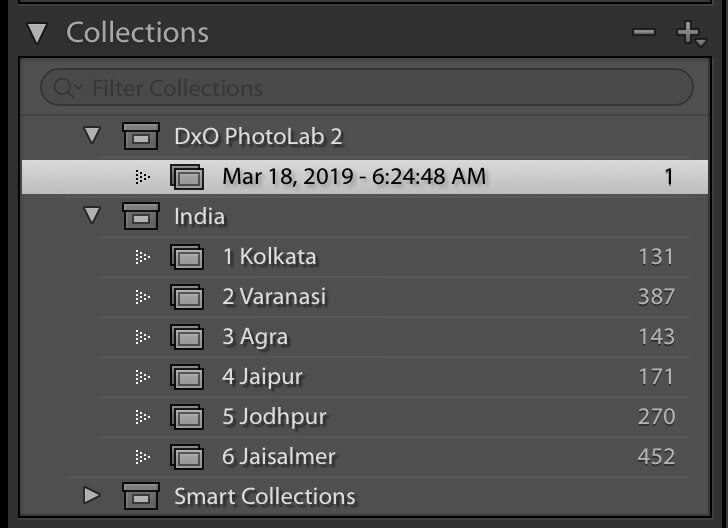 One of the advantages of Adobe Lightroom CC is that there’s no separate “Folders” vs “Collections” views like in Classic. This makes it a lot easier to manage and find your files, however it also means that there’s no local file structure to tap into. Every photo is stored in the cloud, and even if you choose to have all originals backed up locally, adding an image into that folder in your file system won’t make it automatically show up in Adobe Lightroom. So you have to do it all manually. I’ll break it down step-by-step, but here’s the short version of what you’ll have to do. Export the RAW file from Adobe Lightroom CC, open that into DxO PhotoLab 2, export a TIF or JPEG file from DxO PhotoLab, import that back into Adobe Lightroom CC, then delete the originals in the Finder — (maybe). 1. 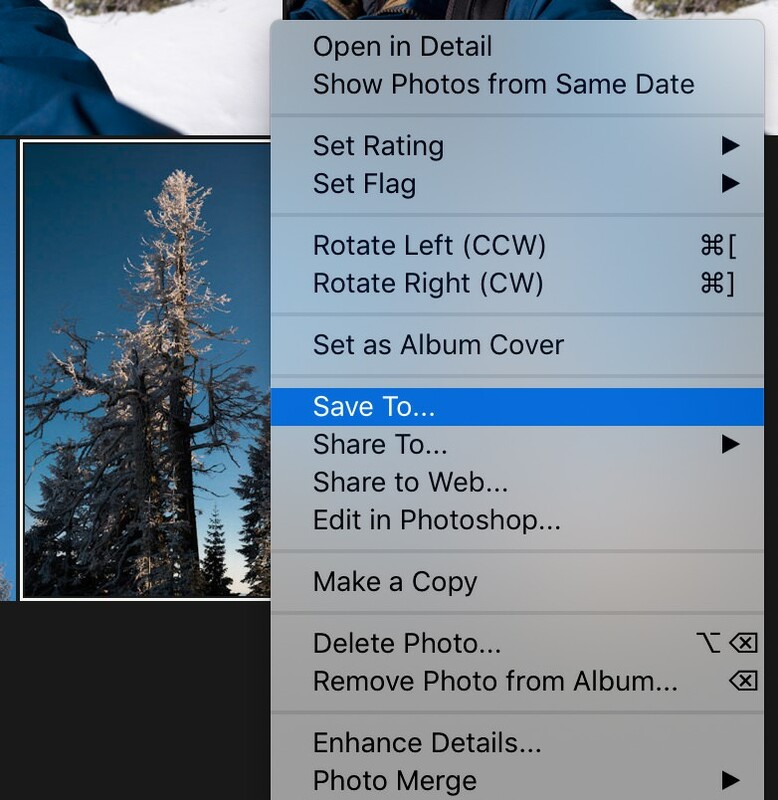 Right-click on the photo you want to edit, and choose Save To… and then set the file type to Original + Settings. Right click and save the image you want to process in DxO PhotoLab. For the Location, create a new folder that you’ll use every time for this (that’ll make it easy to find the photos in DxO PhotoLab and also in the operating system so you can delete them later), called something like “Lr CC to DxO PL2 TEMP” as I did, and save the image there. Save the original in a dedicated folder for this workflow. 2. Launch DxO PhotoLab 2, and navigate to that same folder. On a Mac, if you want to make it easy to find, you can add the folder to your Favorites list in DxO PhotoLab. This list is actually a mirror of the favorites in macOS, which means you need to add that folder to the sidebar in the Finder. Then it’ll show up in DxO PhotoLab under the Favorites, as in the screenshot below. On macOS, adding a folder the the Finder sidebar will make it show up under Favorites in DxO PhotoLab. The photo will be right there waiting for you. Select it, and edit away! 3. 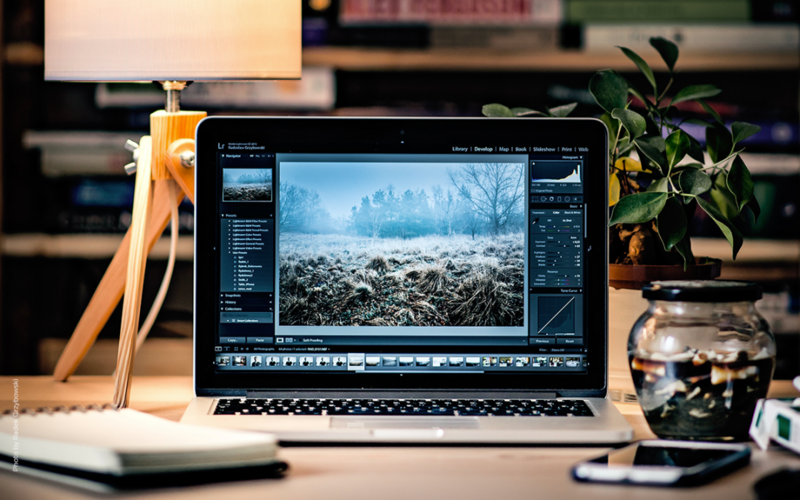 Once you’re done editing, it’s time to render the photo to bring back to Adobe Lightroom CC. Click the Share button near the bottom right corner, and choose Export to disk. Do not choose Export to Lightroom — that’s for Adobe Lightroom Classic, not CC. 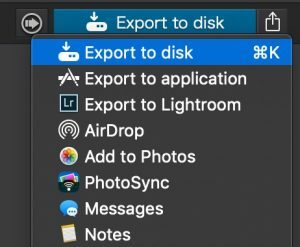 Be sure to choose Export to disk, not to Adobe Lightroom! In the export dialog, you need to choose what format you want it to be in. You could select TIF (very high quality) or JPEG (much smaller file) — it’s totally up to you. (Remember that in Adobe Lightroom CC, you’re paying for cloud storage, so choose big space-hogging files like TIF sparingly). If you want to ensure you always choose the same setup, this would be a great opportunity to make a new preset just for this purpose that you’ll use over and over again. Once you’ve made your decision, click Export. When it’s done exporting, you’ll see the image you just exported next to the original in DxO PhotoLab. 4. Time to re-import the photo into Adobe Lightroom CC. First, make sure you’re still in the same Album you were in when you exported the original file. 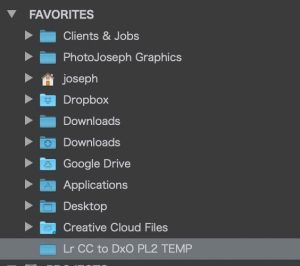 Then choose File > Add Photos… and navigate to the “Lr CC to DxO PL2 TEMP” folder (or whatever you called it). Again if you’ve added it to the sidebar in macOS, you’ll have quick access to it here, too. Don’t worry about selecting the right file; just click Review for Import and let Adobe Lightroom scan the folder. It’ll only let you import the new images; it will recognize that the RAW file you exported earlier already exists in Adobe Lightroom. Adobe Lightroom recognizes the RAW file and won’t reimport it; the new one is already selected for import. Since you started this import while in the Album the original RAW photo is in, at the top of the Adobe Lightroom CC import window you’ll see “Add to Album” and the album name you started in. Double check that it says that now, so you’re sure the photo goes to the right place. If it doesn’t, click that text and choose the right album. Then click “Add Photo”. Once the import is complete, Adobe Lightroom will take you to a “Just now” album, showing you only what was just imported. This is a little annoying, but that’s what it does. Scroll back down to select the album you were working in and you’ll see the two files side by side. 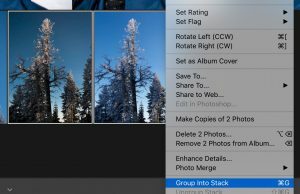 As an alternative final step, you could select both of the images and stack them together by right-clicking and choosing Group into Stack. Stacking your photos will keep them together so you know they are versions of the same image. 5. Now, you could clean up the leftover images in the “Lr CC to DxO PL2 TEMP” folder; they’re already in Adobe Lightroom CC and on their way to the Adobe cloud. If you delete them you’ll be freeing up space on your hard drive. However you could leave the .dop file, which contains the adjustment instructions for the photo you were just editing. So here’s a neat trick — go ahead and delete the RAW file, its XMP file, and the rendered JPEG or TIF. But — leave the .dop file behind. It’s tiny; just a few KB. Then if you ever decide you want to continue where you left off with the RAW file in DxO PhotoLab, just re-export the original from Adobe Lightroom CC to that same folder, and when you look at it in DxO PhotoLab, all your previous non-destructive adjustments will still be there! Leaving the raw and .dop file means you can continue the edit in DxO PhotoLab at any time — but even if you delete the RAW file now, you export it from Lightroom CC again later and still pick up where you left off! Clearly it’s a lot more steps using Adobe Lightroom CC than Classic when you want to edit a RAW photo in DxO PhotoLab. But, if you follow these steps (especially creating a dedicated folder) you’ll have a quick and repeatable workflow that’s only a few extra clicks and ends up taking almost no additional storage space!